Sichuan style red-braised beef noodle soup, although not so famous as Taiwan red braised beef noodle soup outside China, is still the top noodle dishes within the country. Though noodles are not the main character in Sichuan Cuisine, various types of Sichuan style noodles are really delicious and outstanding. Many people in Sichuan province love to eat noodles in the morning as breakfast. 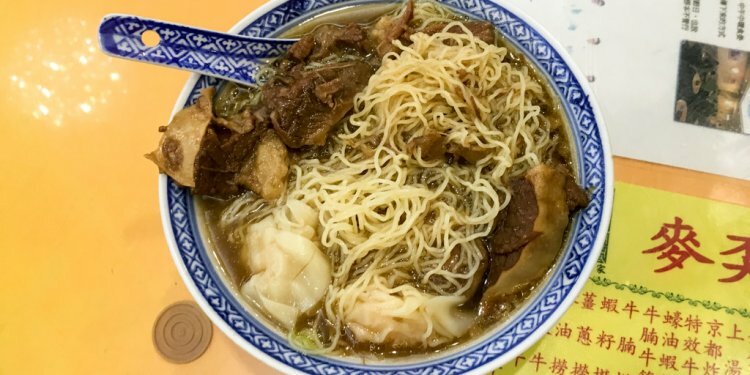 In the small restaurant around the street, it is really common to find dozen of yummy noodles dishes including pea noodles, dan dan noodles and shredded meat noodles. Compared with noodles dishes in north part of China, Sichuan noodles are featured by various tops, featured soup base and other side ingredients, while north noodles are featured by the noodle. Red braised beef is a famous dish from Sichuan cuisine developed from Sichuan style Red-braised beef with white radish. White radish can absorb some of the fats of brisket and which in return provides an excellent taste. Another variety of Sichuan braised beef noodle soup use picked mustard green as a side ingredient to balance the taste. Taiwanese red braised beef noodle is slightly different from the humble Sichuan version, usually with more complex seasonings. Cut brisket into large cubes around 3-4 cm long (not too small because the beef will shrink after boiling). Soak in clean water for around 2 hours. Change water for 4 to 5 times to remove the blood water. In a high pressure cooker, add spices star anise, cinnamon bark, chili peppers, Sichuan peppercorn, scallion, ginger slices and around 2.5 times of water (around 5 cups of water). Press meat to cook for 15 minutes after boiling. If you do not have a high pressure cooker, then the beef brisket need to be simmered for at least 1 hour for a soft taste. Pick the cooked brisket out and filter the soup base. Heat up cooking oil in wok, and then stir fry doubanjiang, ginger slices and green onion sections until aroma. Return cooked brisket in. Add light soy sauce and fry for around 2 to 3 minutes. Add radish cubes and enough soup in to cover the brisket. Add sugar and salt as needed. Turn up the fire to thicken the sauce. Cook your favorite noodle, green vegetables. Scoop the braised beef to the noodle bowl and enjoy. A tip to share, it would be better to mix the braised beef soup with some water for boiling the noodles in order to reduce the spicy taste. Usually I add around 1/2 cup of noodle water in each serving.